Over the last few years, Shell has increased its portfolio in the Caspian region to include activities in all five countries - Azerbaijan, Kazakhstan, Russia, Iran and Turkmenistan - and is the only major oil company to do so. Working in each individual country has brought its challenges. Differences in technology, culture and approach initially made it more difficult to conduct business in the littoral states. It hasn't always been easy, but the initial levels of mistrust are slowly ebbing, allowing the exchange of Western and Eastern cultures in the development of hydrocarbons. Shell's presence in the Caspian 90 years ago was significant, as almost one-third of the company's global production came from around Baku. After returning to Azerbaijan in 1999 with the Inam license, Shell's regional portfolio now consists of: (1) Azerbaijan: 25 per cent, Inam. (2) Kazakhstan: 14.3 percent, OKIOC [Offshore Kazakhstan International Operating Company. (3) Russia: 7.5 percent (with Rosneft), Caspian Pipeline Consortium; 62.5 percent, Sakhalin II (operator); 50 percent, interest in Salym and Komsomol field developments, alliance with Gazprom with initial focus on Zapolyarnoye field development. (4) Iran: Soroosh/Nowrooz (buyback with NIOC [National Iranian Oil Company]), South Caspian Exploration study. (5) Turkmenistan: 50 percent, Trans-Caspian Gas Pipeline, Upstream Strategic Alliance. 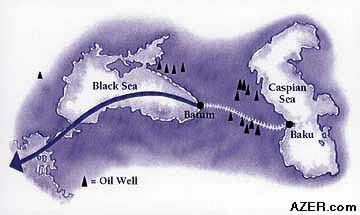 Left: Current pipeline route for oil from Azerbaijan to Western markets. As possible and within its role as a private company, Shell has tried to promote cooperation among the Caspian littoral states. For example, the company recently sponsored an art exhibit with Azerbaijani and Turkmen artists in London with the participation of the respective London embassies. The Silk Road played a major role in the advancement of cultures in this region. One of the most important characteristics of the Road is that each party had something to trade and something it needed. The Chinese traded their silk in exchange for medicines and perfume from their western neighbors. Although silk was a luxury in the Roman Empire in 100 AD, it became common several decades later. This showed that through cooperation, the populations became wealthier, improving their lives. Goods and services as well as ideas, art and culture were exchanged. What was so advantageous about the Silk Road is that it was a network of roads - it was not one single road, which allowed many to profit from the Road's existence. The parallels with today's version of the Great Game and multiple pipelines are apparent. Shell hopes to build on its Caspian presence to play a large role in the region's hydrocarbon development and increase its role in the near future. Geography has played and will continue to play a paramount role in the Caspian. All options for the evacuation of oil and gas should be considered. Onlookers are realizing that, like the Silk Road, where multiple options succeeded in creating what was at that time the world's largest trading network, multiple oil and gas pipelines will ensure that the entire region will benefit. For this reason, Shell hopes to be a catalyst to ensure that energy producers supply those markets requiring energy. The exclusion of any party will increase tension, slowing down the significant progress that has been made over the last decade. Azerbaijan will play a key role in the Caspian's development, with substantial oil and, now, gas reserves, as well as becoming a transportation hub. Shell hopes to build on its participation in Inam to participate in other opportunities with the Government of Azerbaijan. The company believes that Azerbaijan is well placed to act as a hub, potentially supplying oil and gas from its own prospects - as well as those of its eastern neighbors - to Turkey and Europe. International relations and foreign policies are still developing in the region, but it has been increasingly encouraging that much of the Caspian's leadership has taken very a realistic outlook. No single country can do it alone.